PATROLLERS are responsible for ensuring the safety and enjoyment of the thousands of weekend visitors to Lake Mountain during the winter months. assisting with outside agencies such as ambulance and police search and rescue where necessary. ​Patrollers usually spend the day rotating between the Ski Patrol Centre, the ski and snow shoe trails, toboggan slopes, and resort precinct which includes the Snowsports School, Resort Hire, Resort Retail, Alpine Burger Bar and 800-capacity Heights Bistro, and car park area. In the Ski Patrol Centre, patrollers are on-hand in the first aid treatment area and/or managing dispatch which is the communications hub between the SPC and individual patrollers, who each carry a radio, and resort administration. Patrollers are each issued with their own highly visible (insulated) red jackets and vests and waterproof overpants. They also have access to waterproof jackets, boot chains, and also a limited selection of classic skis, boots and poles. Patrollers each carry a first aid pack and a radio. In the SPC, each patroller is allocated a tub in which they can stow personal items such as extra clothing, lunch etc. 8 am: Patrollers arrive and collect their first aid pack and use a checklist to ensure that it is fully equipped. Each patroller does a radio check with their issued radio. A check is also made of other equipment such as transport vehicles, oxygen, defibrillator. 8.15am: Morning briefing with leader of the day (first person named on roster for the day) who allocates duties/rotations/groupings. Patrollers usually work in pairs. 8.30am: Patrollers commence their duties. 12-2pm: Patrollers usually have lunch sometime between 12 and 2pm, subject to what is happening around the resort. Tea and coffee-making provisions/facilities are available in the SPC. 3.30 - 4pm: Final sweep of ski/snow shoe trails, toboggan slopes and car park. 5pm: End of day, subject to how busy the resort is and what is happening. During quieter times, each patroller is expected to work through their training package and have it signed off by a senior patroller. This helps ensure they are are up-to-speed with their competency levels. 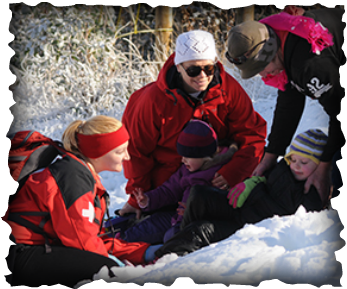 ​Early morning ski clinics are available for patrollers. Please note that this needs to be organised through the leader of the day (first person named on the roster) and the Director of the Snowsports School.